Brooks is a name that stands alone as a legend in cycling. The word legend is easily tossed about, kind of like the word epic, but in some cases, the word does in fact fit the subject. In this case, it’s no exaggeration or cliché to call Brooks England a legend. The company builds a product that is designed to not only stand the ravaging test of time, it also stands as a beacon of refined cycling style. They may not for be for everyone, but for everyone else—Brooks has a devout following. The company, which got its start in the 19th Century, has been producing some of the finest saddles the sport has ever known. John Boultbee Brooks established his eponymously named company on Great Charles Street in Birmingham in 1866. Nearly 150 years later, the company creates 800 to 1,000 saddles a day, in 20 different designs, just a few miles from where it was born. It’s nowhere near the jaw-dropping productivity of the 1950’s, when a workforce of 1,500 produced and sold more than 55,000 leather saddles and 25,000 mattress saddles—per week! The company’s saddles were under each and every major rider for years in the first half of the twentieth century. While the years have marched on since then, the name has only grown in acclaim. We had the opportunity to visit Brooks England in November at its factory in Smethwick on the outskirts of the capital of the Industrial Revolution, Birmingham. The current factory lies in a nondescript, hard used industrial area outside the city. It’s almost comforting to see it in such a place. It is Birmingham, after all. The inside was no less perfect in its industrial feel—the brick building houses a menagerie of machines, processes, and workers, all of which combine to make not just a saddle, but a story—and a bit of living history. I have to admit that before our visit to Brooks, I knew little of the company. I race bikes, so Brooks’s sister company, fi’zi:k, was always more familiar to me through its new owner, Selle Royal. Of course, some would say that it’s sacrilegious to even mention the two companies in the same sentence, but whether you like it or not, they’re now in the same family. I always felt like Brooks was the saddle of the aficionado, which I’m most especially not. I thought of it as a saddle above my class, and for the price, it certainly is. But visiting Brooks is not a visit to an upper class, froufrou place. It’s blue collar through and through, and I felt at home. A lot of our time at Brooks was spent redefining how I saw this respected name. I went from never even considering the idea of putting one of their saddles on my bike to wondering, how good are they, really? I guess there’s a reason why people will ride the same saddle for fifty years. I doubt that my current saddle will be around then. Birth of a saddle. The factory floor is roughly divided into two sections: metal and leather. Correspondingly, each saddle starts as a coil of metal wire and a big chunk of leather. It’s pretty amazing to watch a saddle come to life from such basic materials. 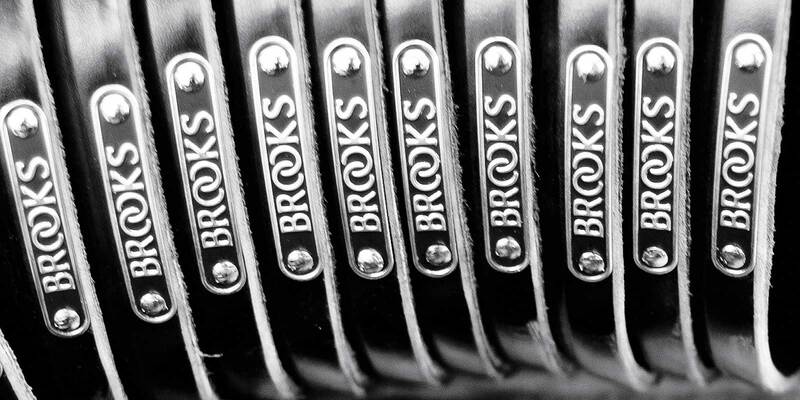 To say that the chain of events that goes together to create a Brooks saddle is extensive is putting it precisely. Large, Willy Wonka-esque machines stand as sentries all across the main factory floor, all seemingly impossible to operate until the right employee walks up and makes magic. It’s not all operation of heavy machinery to create a Brooks saddle though. The production process is equal parts aging, but well-oiled and maintained machinery, as well as skilled handwork. It’s a delicate line that is well trodden by Brooks. While it’s a narrow path to live on, Brooks does it well, but it takes a certain sort of constant vigilance to keep the myriad of machines not only working, but producing exactly what is needed at the quality that is expected for a saddle that is designed to vie for a century of service. Adjustments have to be made for the sometimes-balky machines and the intricate work they perform. When new products are made, they undergo an extensive testing process, and in our visit, this example was embodied by an amusing saddle bashing machine, which mimics the bludgeoning a typical rider would give the saddle over years of abuse, all the way down to the shape of the rider’s rump. When a design passes the beating test, the metalwork begins in earnest and parts are made in large batches. Metal parts are made much more quickly than other parts, but they’re also quite difficult to get everything just right, sometimes taking a day or more to dial it in, so when everything falls into line, it’s time to produce.